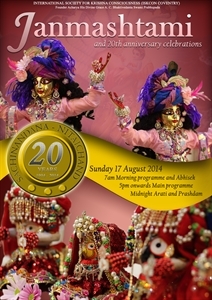 2014 Janmastami & 20th Anniversary Celebrations! We are very happy to be celebrating Janamashtami Festival this year as it is a very special day for us in Coventry. Twenty (20) years ago our Lordships Shree Shree Sacinandan and Nitaichand were installed on Janamashtami Day. Since then, our Lordships have mercifully engaged so many sincere devotees and changed their lives for the better. So many individuals have benefitted from listening to the messages of Bhagavad Geeta spoken every week at the Temple. Our Balagopal Club, for the very young, is regularly teaching values like respect for parents, elders and teachers. The young are taught musical instruments, singing, religious dramas and verses from Bhagavad Geeta. In twenty years, many festivals have been celebrated, many yajnas performed in lots of houses and countless home satsangs enjoyed by so many. ISKCON Coventry’s kirtaans are very popular at the various Rathayatras in London, Birmingham, Leicester and Cardiff. Credit for all the above success goes to our wonderful installed deities Shree Shree Sacinandan and Nitaichand. A group of sincere pujarees are serving them each day and they look happier and handsome each day. To mark this year’s celebrations, we are putting a new carpet in the Temple room, decorating and painting the Temple Room, most importantly, we would like to change the Altar curtains to further beautify the Temple room. Please come with your family and join us in this year’s celebrations. We are sure you and your family will enjoy the spiritual experience we are planning to offer you. As always, to make it a great celebration we need your help in achieving that. We are appealing to our guests to give generously so we can make the essential changes for the pleasure of Sacinandan and Nitaichand. We are sure this in turn will also make you happy when you visit. We are looking forward to your visit. Thank you for your continious support.